Many folks loathe the latest version of Skype on the Mac. That’s because it’s clunky and unpleasant to use. The iPhone version of Skype, however, is a fine app that works great for making VoIP calls and video chats while you’re mobile. Annoyingly, the app does contain ads. But they’re easy enough to avoid. Once you’ve logged into your Skype account, the app by default shows all your Skype contacts. I prefer to just see who’s online right now; fortunately, Skype makes changing that list easy—though it doesn’t always seem to remember my preference between relaunches. Tap on a contact, and you can place a video or voice call, send an IM, or send a photo or video message. You can also use Skype to place calls to real phone numbers, though doing so requires that you pony up for Skype credit. Bizarrely, though, dialing on Skype’s in-app keypad is awful: The keypad seems to linger behind taps by several seconds or worse. Touchtones sound for half a second, and numbers can take way too long to show up. It’s clearly a bug, and an embarrassing one, and one we all hope gets fixed post-haste. Video chats and audio calls alike have, at worst, reasonable quality on Wi-Fi. I started to experience the expected stutters and hiccups when I switched to cellular data on a video call, though audio continued to perform capably. Skype can work fine in the background, too; you’ll receive push notifications for incoming calls and messages. I did find, however, that my iPhone would ring endlessly if I answered an incoming call on my Mac instead—at least until I silenced the alert on the phone. The latest version of Skype for iPhone is a capable app for audio and video chatting, and it works over Wi-Fi and the cellular network alike. Though the app exhibits a few annoyances, it’s free, and it works just fine—including some times when FaceTime seems more finicky. 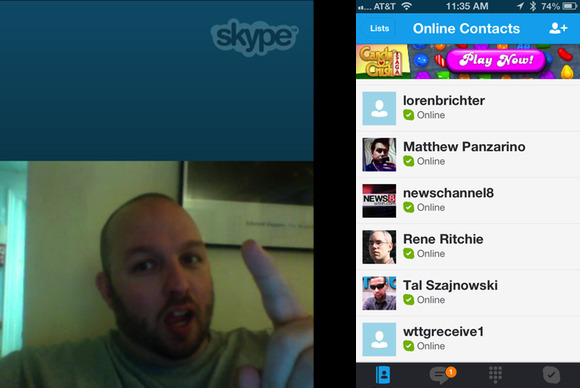 Despite a few flaws, Skype remains a fine app for VoIP and video chatting on the iPhone.